The Rotary Club of Skagit, chartered in 1986 has 68 men and women representing a wide cross-section of local business and professions. The club meets each Wednesday for fellowship, breakfast and interesting and informative programs dealing with the topics of local and global importance. 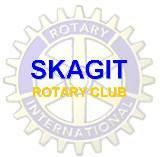 The Rotary Club of Skagit has earned a reputation as being a fun loving dynamic and high spirited organization. In concert with Rotary's motto of "Service Above Self" the Rotary Club of Skagit has demonstrated a deep commitment to the community in which we live, both locally and globally, through the many worthwhile projects the Club has initiated, participated in and jointly supported. Our club is always seeking speakers that have an interesting and informing presentation. We welcome speakers that will present items of community interest. Since we are not a political or religious organization, we ask that the topics appeal to a wide audience of diversity. If you have an interest in joining us for a program and breakfast, please contact the Program Director. If you are a Rotarian that needs a makeup - come and join us! We know you will enjoy our meeting and we always enjoy visiting with our fellow Rotarians. We invite you to take a look around our site and learn more about our club and Rotary.